Though it's been on the warm side here in Virginia, I can't help but dream of soft, snowy days. You know, the ones where the kids come in and out from rowdy snow play while you've been curled up with a good book, and the family gathers around the table for some hearty soup and good conversation. Whether your good conversation revolves around current events or American Girl dolls (the case in our home), it's nice to be together. 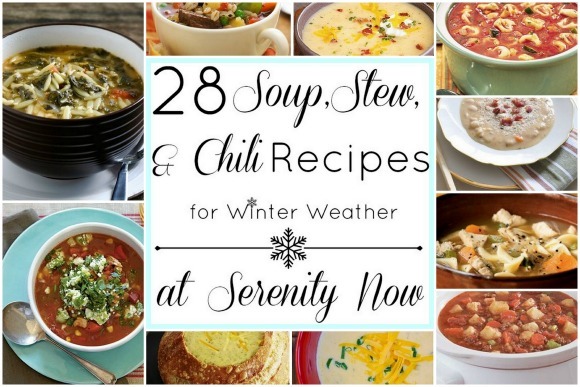 With those scenes in mind, I thought I'd round up some of the tastiest Winter Soup, Stew, and Chili Recipes that I could find and share them today! Each source is listed below the photo, so please be sure to click and Pin from those so each person gets credit for his/her own work! Hope this list gives you a nice place to start your menu planning! There are more than a few on this list that I want to try out. Great round up Amanda! I'm sure it will cool back down around here and I will whip up some more soup. It's going to be in the 70's down here in Raleigh!! What??!! Oooh, some of these look amazing. PINNING! I'm with you, Amanda. I've been making some sort of soup or stew once a week. This week it was baked potato soup. Thanks for the fresh ideas. PS> three of the images didn't show up for me. Not sure if it's my computer or not. Quick-Cooking Classic Soups & the last two. I love making soup. I feel like it's a great way to sneak in veggies and other healthy stuff! The only problem is my hubby isn't a big fan of soup and the kiddos usually groan when I say we're having soup for dinner:) I make them eat it anyway, but we don't have it all that often. Nothing like a hot bowl of soup, stew or chili on a cold winter day. You've rounded up some awesome recipes here, Amanda. Thanks so much! Hey Amanda! Clicked your link to find some recipes and was so surprised to see my Cheese Soup! Thank you!! Pinning this so I can come back later to pin the indiv ones...great roundup.